So, what more can we say about the DJX, as this entire expiry we have been pointing out how fluid its zone is, so yet another move should come as no surprise. And, here it is now up at 25100-25400. In fact, it could just as easily be 24800-25400. The surprise, is the abysmal level of activity, although there could be a degree of netting off in there. All in all, very similar to the SPX, rising zone, receding ratios above it, but the difference here is the ratios below it have actually slipped. 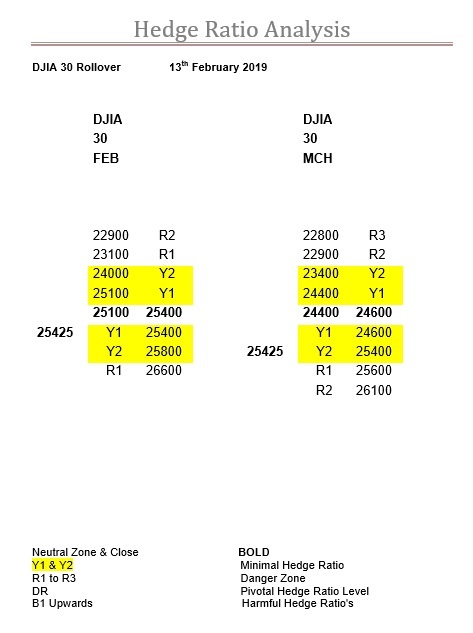 Therefore, the DJX can just muster two out of the three bullish pointers. However, the same applies regarding the expiry, the zone would be nice, but anywhere in the Y ratio is close enough. Also, shock susceptibility looms large here as well. Remember it’s a triple this expiry. These are generally a bit more rip-roaring than intermediaries, just because of their size alone really. So, the same malaise persists, a ridiculously wide Y ratio bandwidth. Therefore, it is going to be simply a case of whether the DJX retains its bullish blinkers, or, acts normally. If its normal, then a trading range of the Y1 ratio bandwidth is more than likely ( a cool 2000-points), and between the R’s is not unheard of, which is actually not that much wider. However, worth noting is the significance of 25400, in both expiries.